8" Bread Knife. Stainless Steel..
8" Carving Knife. 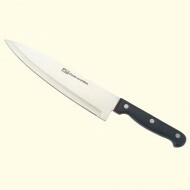 Stainless Steel..
8" Cook's Knife. Stainless Steel..
3" Paring Knife. Stainless Steel..